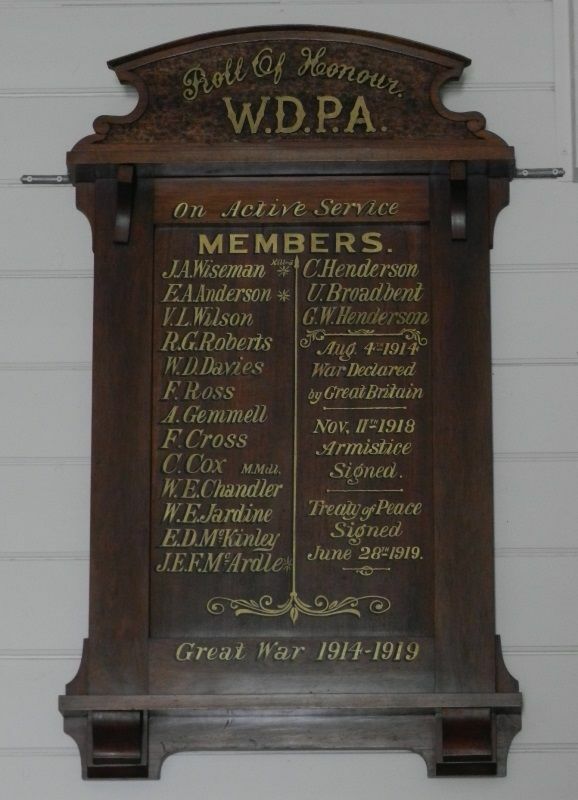 A wooden honour roll commemorates past and present members of the Association who served in World War One. The roll was unveiled in 1917. A very successful and enjoyable concert was held in the public hall, Wareek, on Wednesday evening last, almost the whole programme being supplied by leading Maryborough artists. Needless to say, every item was much appreciated, and received well-merited applause. The president of the Wareek Progress Association, under whose auspices the entertainment was being held, to help clear the debt of the local hall, acted as chairman. and fulfilled his duties in his usual capable manner. Miss Kerr, of Maryborough, made an efficient accompanist. One of the most interesting events of the evening was the unveiling of the Honor Roll, erected by members of the association, in recognition of those past and present members, who had enlisted in the service of King and country. The board is a handsome one, Australian wood, of a rich brown color, highly polished, against which the gold lettering shows up very effectively. The workmanship reflects credit on Mr. Branton, who carried out the order. Mr. Bartlett spoke of these boys who had answered the call to arms, and asked the audience to rise and sing "God Save the King," followed by "God Bless Our Splendid Men." He then drew aside the Union Jack, and read the fifteen names inscribed on the board. They are as follow:-Privates J. A. Wiseman, E. A. Anderson, V. L. .Wilson, R. G. Roberts, W. D. Davies, F. Ross, A. Gemmell, F. Cross, C. Cox, W. E. Chandler, W. E. Jardine, E. D. McKinley, J. E. F. McArdle, C. Henderson and U. Broadbent. To these another name, G. Henderson, Adelaide Lead, must now be added. The first-named two have paid the supreme sacrifice, while Privates V L. Wilson and G. Roberts, both of whom were present, have received discharges. Private C. Cox had won distinction,and been awarded a military medal. Three rousing cheers were given for the boys.